Today, as part of Perfect Picture Book Friday, I’m sharing Kelly Bear – Earth, one of a series of lovely picture books and workbooks that help parents and children talk about important issues and concerns. With Easter coming up this weekend, I’ve included a fun Easter craft at the end. “Hi! My name is Kelly Bear and this is a book about me. I live on planet earth. It’s a wonderful place with plants, animals, air, soil and water. There is only ONE earth, so I’m doing all I can to take care of it. I want everyone to enjoy living here. Children will love Kelly Bear! The text explains how Kelly Bear and her family contribute to the good health of the planet and the simple illustrations clearly show this as well. The author, Leah Davies, has been dedicated to the well-being of children for more than four decades. Her professional experience includes being a certified teacher, school counselor, instructor in the Family and Child Development Department, Auburn University, and director of educational and prevention services at a mental health agency. From an Amazon review: “The Kelly Bear Beginnings Series of books is priceless. In a simple yet powerful way they engage young children and help them understand, verbalize and accept their feelings, improve their behaviors, and learn to care for their bodies. In this fourth book, children learn not to waste water, electricity and food, to recycle, and to keep our air clean. The book empowers the child and makes him aware of his environment. These books are invaluable in the classroom as well as in the home. For those of you who fondly remember the wonderful Mr. Rogers and his Neighborhood, you’ll find a kindred spirit in Leah Davies. The friendly green bear, drawn by the author’s daughter, Joy Hallett, gives children a warm and fuzzy feeling of acceptance and trust. Joining a group that is interested in managing our resources and that includes children. Drawing pictures and writing letters to send to newspapers and legislators. This book brought back very fond memories. When our oldest son was only 3 years old, we took part in a riverside cleanup. I have pictures of this sweet little boy, dragging a huge plastic garbage bag as we all picked up trash that littered the riverbank. This type of activity encourages a young child to be more aware of protecting the environment. Just as importantly, doing things as a family strengthens the parent-child connection. Let’s combine a craft activity for Easter with one for this book! You know how much I love using paper bags for kid’s craft projects. Your child can use this bag for collecting jelly beans or Easter eggs. 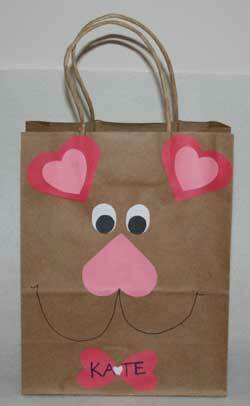 You will need: 1 paper lunch bag, construction paper, glue, markers, scissors, yarn and a hole punch. Cut out eyes, ears, nose and bowtie from construction paper…this craft was made for Valentine’s Day originally so there are lots of hearts. Glue the pieces onto the front of the bag. Punch holes at the top of the bag and string the yarn through the holes and tie to make handles. Draw other features with the markers. Read the rest of the Perfect Picture Book Friday book reviews on Friday mornings here. This entry was posted in author Leah Davies, Easter craft, Environmental awareness, Kelly Bear Books, Perfect Picture Book Friday and tagged author Leah Davies, behavior modification, conserving natural resources, Easter craft for kids, Kelly Bear - Earth, parenting, Perfect Picture Book Friday by viviankirkfield. Bookmark the permalink. This sounds like a really cute book with an important message. I’ll have to check it out! And I like your Bear Bag! Thanks for sharing! Oh Erik, that is quite special. :) Passing down treasured items helps bring us closer to those who came before us. Fantastic for an earth day project or any other discussion on how we take care of Mother Earth. The follow up activity is simple and appealing. This could even be done in preschool. Great to begin teaching children at a young conservation ideas. This sounds like a fun book to do so. I nearly ran a similar book today, but decided to hold it. Cute activities. I’m on a ‘new’ conservation kick – so your pick is down on my list today too! Just watched a doc on chemicals in the house, and feel inspired to start making some of my own products. I was doing pretty good already, but I love finding something that stirs things up again! Great bag! Going to try and make my own laundry detergent! Now why didn’t I think of writing a book like this one. That’s so funny, Tracy…so do I…I know we should try to encourage kids to express their creativity…and sometimes coloring books (where they ‘have’ to stay in the lines) might seem not to do that…but, on the other hand, learning to stay within the lines is great for fine motor coordination. And when I visit with my grandchildren, I do love to color with them. :) Glad you liked the little ‘Easter bag’. It’s challenging to create stories like this without coming over as preachy and Kelly Bear sounds like such an endearing personality kids will want to learn from her. Very important topic for us all! Thanks, Joanna! Kelly Bear is an endearing personality…and she shows how simple changes can make a difference for everyone. I just had that refrigerator-door-open conversation with Cooper. Hmmm, perhaps I need to find this book. Thanks Vivian! My kids weren’t as bad as my husband. 🙂 Our fridge has a beeping sound that goes off when either the fridge or freezer door is left open more than 20 seconds or so. I can’t tell you how often I hear ‘beep, beep, beep, beep’…he will take ice cream out of the freezer and bring it to the counter, get his bowl, scoop out what he wants…and all the time the ‘beep, beep, beep, beep’ is sounding. I love him dearly…but when they say that men are sometimes like little boys, they are right. :) I think it is a very lovely book series, Kirsten. Kids love to make stuff…and simple is perfect for the little ones. :) Thanks, Nancy! 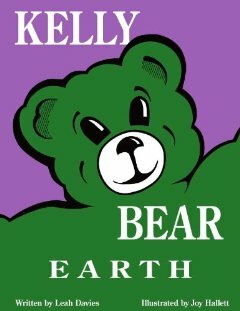 Oh My, I came across a Kelly Bear book in the library last week. This author has great ideas and makes it interesting for the kids. Just love your Easter Bag, so cute! Thank you Vivien for a very interesting post. Oh…I’m so glad the Kelly Bear series is in some libraries…I think they are helpful books that address a variety of issues and concerns…and would give parents a perfect opportunity to talk with their kids.Glad you liked the bag…less is more. :)Happy Easter, Diane! Sounds wonderful, Vivian. I will check at my library for the Kelly Bear series. What wonderful books for the classroom. Love your Easter Bear Bag!